SOUL FOOD for Hungry Adult Communities: Pentecost 2013. Soul Food for Hungry Adult Communities, Pentecost Sunday, May 19, 2013. See Mass Readings for this Sunday. Click here. VICTORIA Falls on the Zimbabwe/Zambia border. 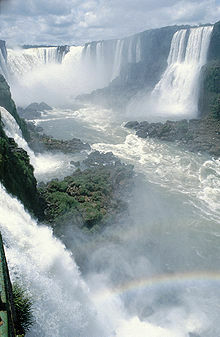 There’s the IGUAZU falls in South America, on the Brazil/Argentina border. None of these compares with the power of what happened at Pentecost, and what is still going on in every corner of the world,- the power of God the Holy Spirit working in the hearts and lives of individuals and communities who are open to this. This is the power of the immense love of God’s heart, working in the world. Things happen in societies. Changes occur that are for the good. Gay and Lesbian people are welcomed in society, a far cry from years ago. And that’s great. The Opening Ceremony of the Olympic Games in London 2012 was a wonderful celebration of human beings and communities, with great sensitivity to the damage that industrial and commercial greed can do to communities. The Opening Ceremony of the Paralympic Games in London 2012 was a powerful celebration of the talents and abilities, the determination and achievement of people facing every kind of physical challenge. They weren’t ‘disabled’, they were PEOPLE, first and foremost. In moments such as these, is the Holy Spirit changing hearts and societies, around the world. I believe so. joining, and the different flags being raised, one by one. What moved me deeply is that, just fifteen years earlier, not one person in Europe could have dreamt that this might happen. 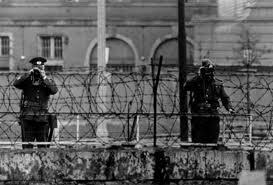 In 1989, the Soviet Union was still in place, the Berlin wall still standing. Who would have dreamt that, in a very few short years, countries that were once at the heart of Europe, would now be back again in the European Union. It was a ‘Niagara’ of a change. Was the Spirit of God at work in all of this? I believe so. England.- and other places beside. 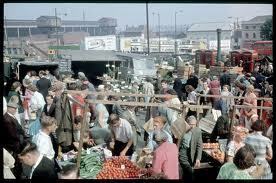 In the city centre, at the Bull Ring, today, it was like Pentecost Sunday,- every language, every nation, all milling about good humouredly, and you could get every kind of ethnic food. And that’s what Jerusalem was like, that Pentecost Day, full of visitors from all parts, when that ‘Niagara’ of the power of God came on the previously frightened men and women,- about 120 of them, according to the Acts of the Apostles,- and they all went out fearlessly into the market place, filled with God’s very own love for every person and nation and people. They brought burning love to the societies they met. They spoke of the love of the Creator for people; they spoke of the healing of hearts and lives, the opening of eyes, the forgiveness of past failures, which Jesus of Nazareth, the Christ, the Risen Crucified Lord,the Redeemer, brought to every one and nation. They witnessed the courage, the fire, the enthusiasm, the fearlessness, the bigness of the Spirit of the Most High God that was now at work in them and available to every society and family and person. They entered into a love-filled, respectful conversation with people of every culture and belief system. And all who saw it were astonished. This was the ‘Big Bang’ moment when the Church was born, and a powerful centrifugal force drove those now-willing disciples of Jesus in every direction, eventually to every corner of the world. The ‘torrent’ that is the Holy Spirit, the ‘cauldron of fire’ that is the Holy Spirit, the ‘gentle breeze’ that is the Holy Spirit, the mighty river or the tiny stream,- all are but images of what God’s Spirit, the ‘Promise of the Father’, is continuing to do in the world, in societies, in families, in individual hearts. 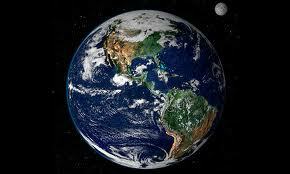 ‘All over the world, the Spirit is moving’ says the song. The Spirit is larger than all of the created universe, and is as personal as a new-born baby. Let ‘the love of God, poured into our hearts by the Holy Spirit’ (Romans 5), be a POWER-full centrifugal force in our communities. ‘Caritas Christi urget nos’,- ‘the Love of Christ drives us on’, says St. Paul. We too are called to enter into loving, respectful conversations with people and cultures and sub-cultures, with different age-groups from our own, and let the Spirit of God radiate from us. ‘Each new generation is a new continent to be won for Christ’, said Pope John Paul 2. ‘Give us once again all the miracles and gifts of Pentecost’,- Pope John 23’rds Prayer for the World, before the Council began those 50 years ago. ‘Give us again all the miracles and gifts of Pentecost’ is our belief and prayer for our Church and world in 2013. God wants Pentecosts in every generation of the Church. ‘I want it all, and I want it now!’ said one participant at a seminar on the Holy Spirit. 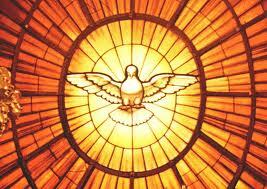 Image of the Holy Spirit, from over the High Altar in St. Peter's, Rome. ← Soul Food for Young Adult Communities: Pentecost Sunday, May 19 2013.